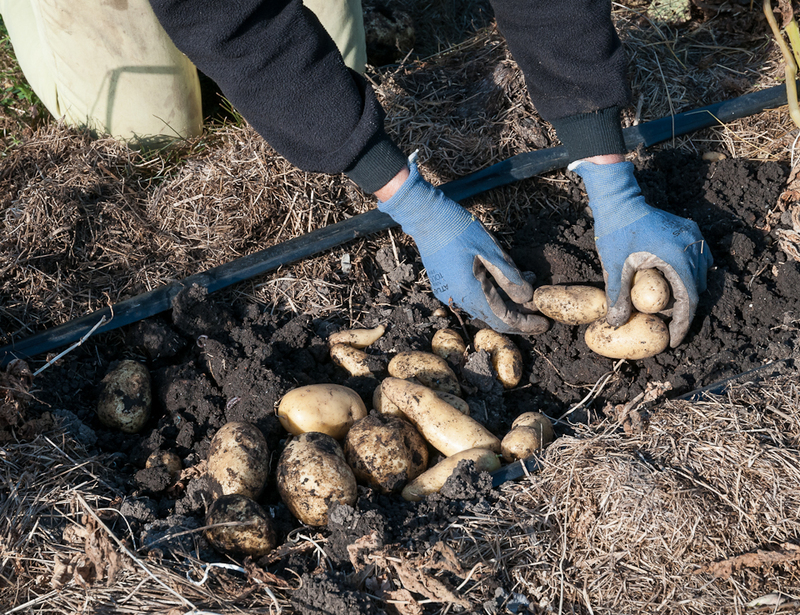 Digging potatoes always reminds me of the time years ago when a friend’s young son was visiting and helped me dig. I’d lift a potato from the dirt and ask: “what’s this?” and he’d say, “food!” I’d dig some more and ask again and he’d repeat delightedly “food.” Perhaps he would have said “food” in response to any vegetable I held out, but his happy identification of potatoes as food charmed me. Potatoes are food, not always glamorous or exotic but definitely reliable and comforting. I grow potatoes every year, not with the slightly anxious excitement that accompanies starting peas or tomatoes, but more with the sense of assurance that comes with planting something I know will grow and be ready when I need it, either directly from the dirt in summer and fall or later through the winter from the storage bin. And while I rarely do anything really fancy with them in the kitchen, I cook with them often and their earthy sweetness, whether alone or combined with other flavors, is always satisfying. For the past few years, I’ve grown two fingerlings, Banana and Rose Finn Apple and two yellow potatoes, Carola and Yellow Finn, planting them at the end April. By mid-June the plants were blossoming and in early July I started digging Carola and Banana. The Yellow Finn and Rose Finn Apple come later and I’ll harvest the entire crop at the end of September, putting each variety in labeled paper bags in a closet at the end of our garden shed. It’s dark and cool and there is an electric outlet where I can plug in a light bulb if I’m worried that the temperature inside the closet will drop below freezing. Next spring I’ll write more about the steps that lead up to the potato harvest. While they are not as exotic looking, or as photogenic, as the first asparagus, peas or fava beans, the first thin-skinned potatoes of the season are always a treat. I usually steam them and we eat them warm with butter and salt or marinate them in mustardy vinaigrette and eat them as a salad, easy and satisfying, alone or mixed with other spring vegetables. While steaming is a great way to cook new potatoes, better than boiling because it keeps them from disintegrating before they are cooked through, roasting is my favorite way to cook potatoes partly because it’s so fast and easy but even more because the outsides become crispy with oil and salt and the insides stay soft, two treats for the tongue. 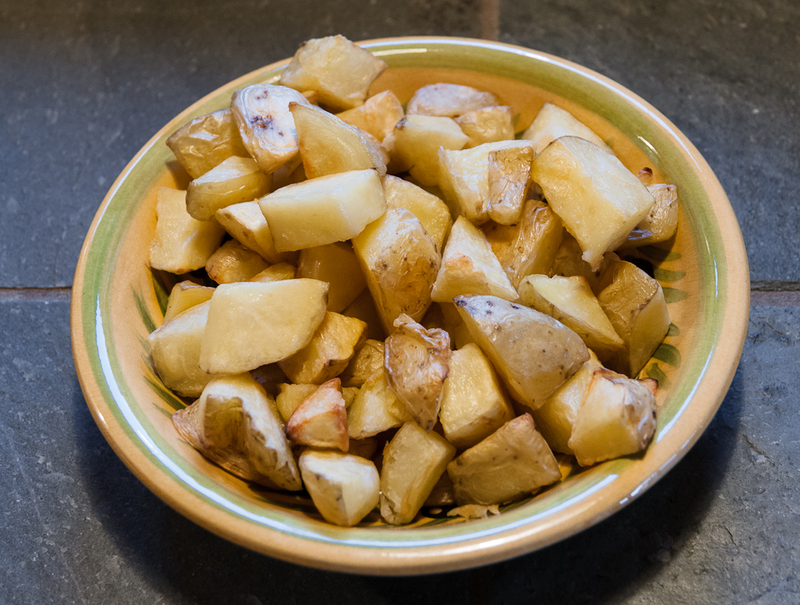 I’ve learned that it’s important that the potatoes be really dry before coating them lightly with oil, so after washing and cutting them into equal-sized pieces I wrap them in a towel and rub them dry. Then I toss them with a little olive oil, spread them in a single layer on a pan, sprinkle on salt and put them in a 425 or 450-degree oven until they are done, usually in 20-30 minutes. 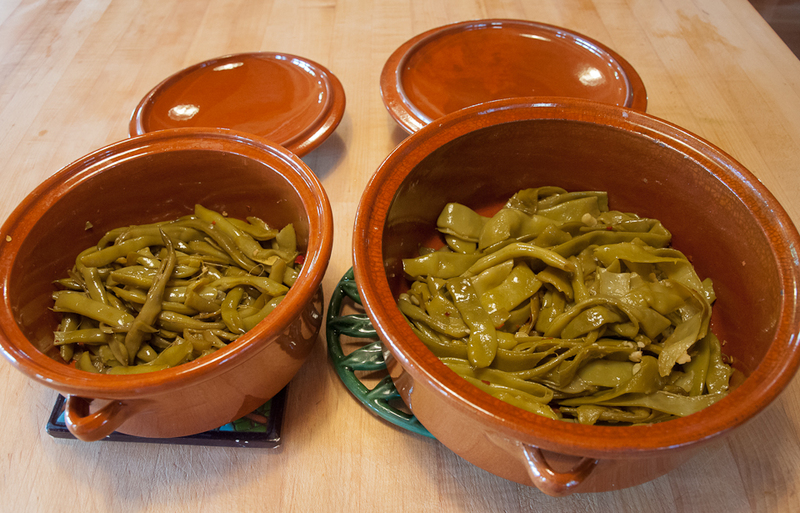 Halfway through the cooking time, I loosen them and turn them over so both sides can crisp. Roasted potatoes are delicious on their own but adding other vegetables to the roasting pan enhances both the potatoes and the other vegetables. 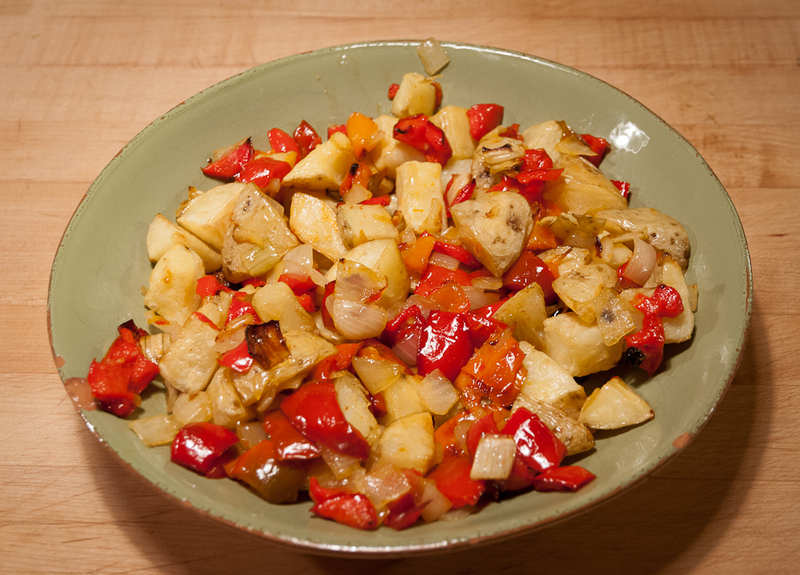 This time of year, I often roast chunks of potatoes with newly harvested onions and sweet peppers. 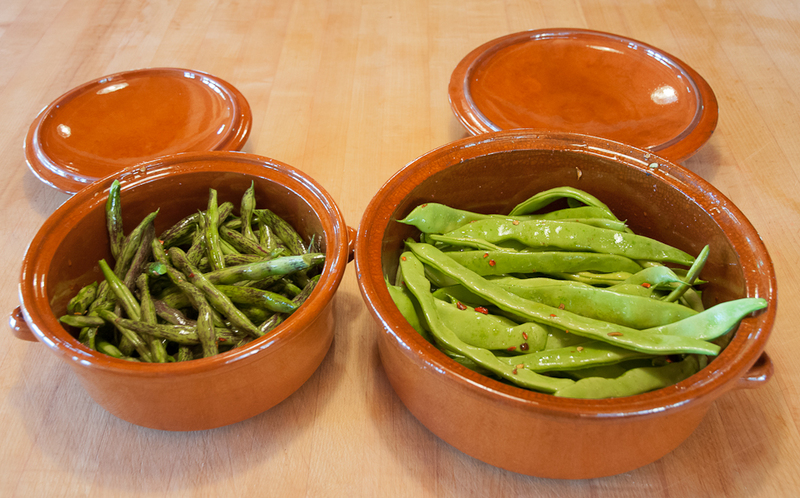 They melt together into a mix of pungent, spicy/sweet and earthy flavors. In winter, potatoes join a mix of squash and turnips, rutabaga, parsnips and onion in the roasting pan. Not as dominant as the other more deeply sweet roots, the potatoes remain there in the background, familiar and comforting. And for one more special treat with roasted potatoes, there is my friend Kathy’s amazing potato salad made with roasted potatoes. 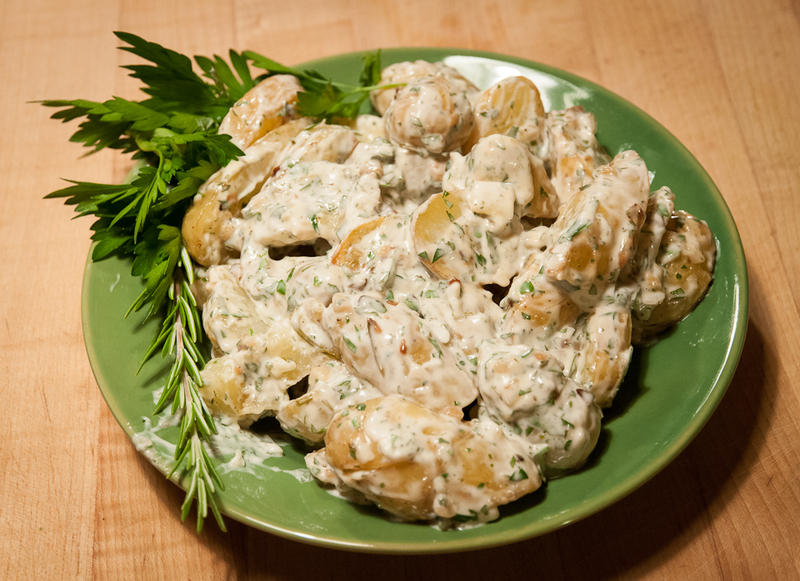 The recipe is from the Dean and DeLuca: http://www.deandeluca.com/recipes/recipe_garlic-roasted_new_potato_salad.aspx. Kathy makes it in the summer with new potatoes but we agree that it’s good any time of year with any potatoes. It’s potato food as its best. 2. In a small bowl mix the mayonnaise with the remaining garlic and the parsley. Squeeze the juice of the lemon halves, making sure to remove seeds, into the mayonnaise. Stir until it is smooth. 3. Combine mayonnaise with the potatoes and serve. 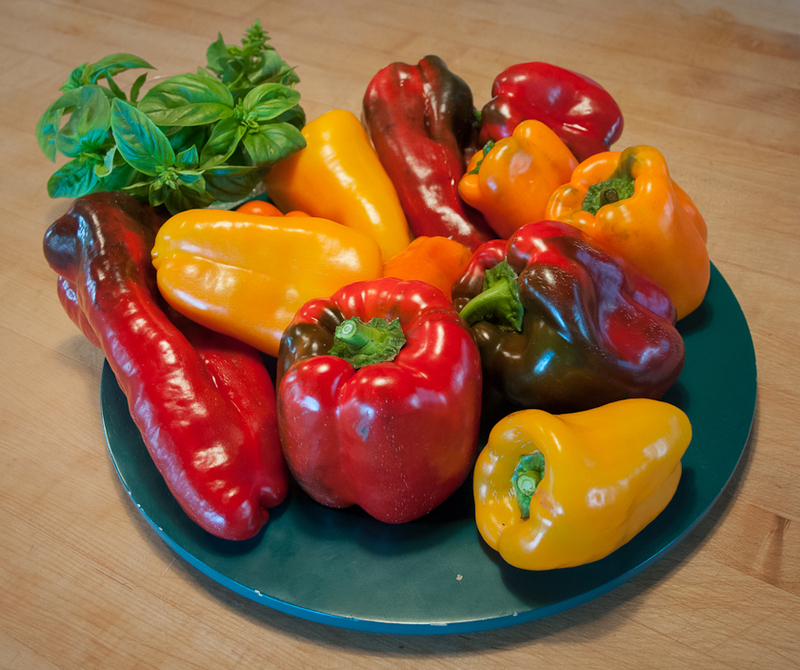 The red, orange and yellow peppers—Revolution, Gourmet, and Flavorburst—in my kitchen garden are ripening finally, their dark green giving way to bright colors, and with these colors come their sweet and spicy flavors. They are delicious raw, sliced length-wise for snacks or lunch, as scoops for dips or piled into a bowl as a quick side dish for a casual dinner. 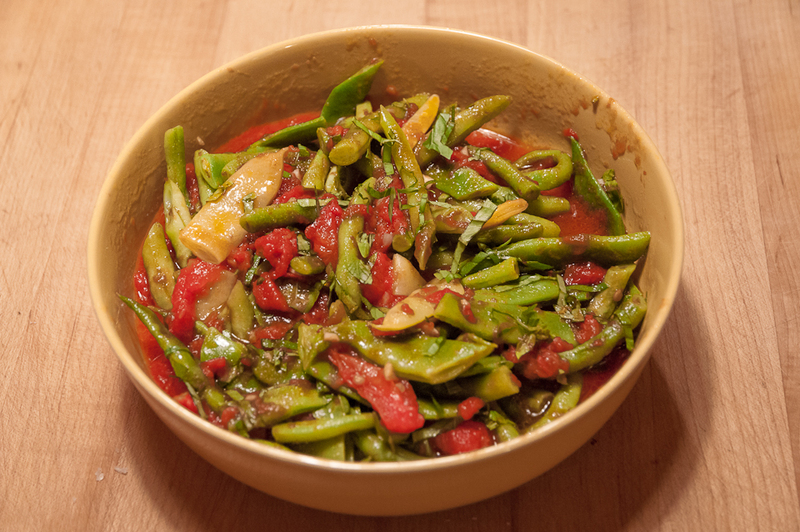 The other night, though, I wanted a more interesting presentation than the simple slices so I turned to a source that never fails me: Alice Waters’ Chez Panisse Vegetables (1996). My dining companions and pantry shaped my first version of this salad. 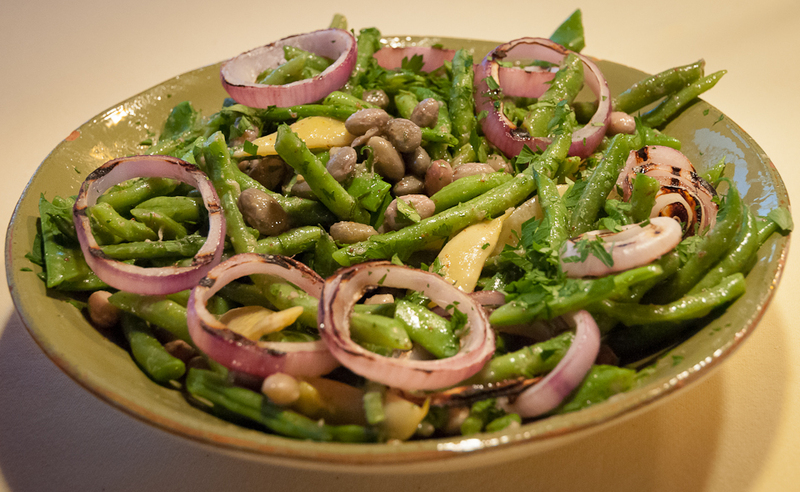 I left out the raw onion because some people dislike it and used capers but not nicoise olives because I didn’t have any. I added lots of red pepper flakes and garlic but no jalapenos because, again, I didn’t have any. 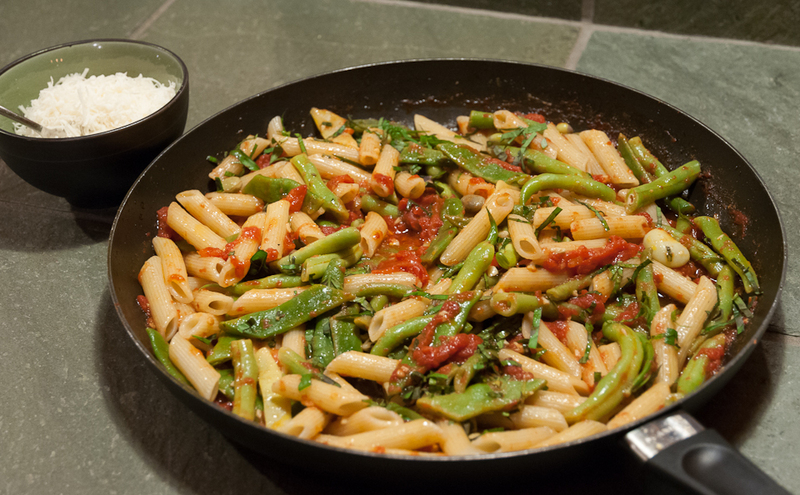 And I added lots of basil. I used my food processor to slice the peppers. The 2 mm blade made thin but still crunchy slices, and the pepper juices released by the slicing blended wonderfully with the vinaigrette of red wine vinegar and olive oil. I took the salad to a potluck where the featured dish was crab rolls, an end-of-crab-season treat. 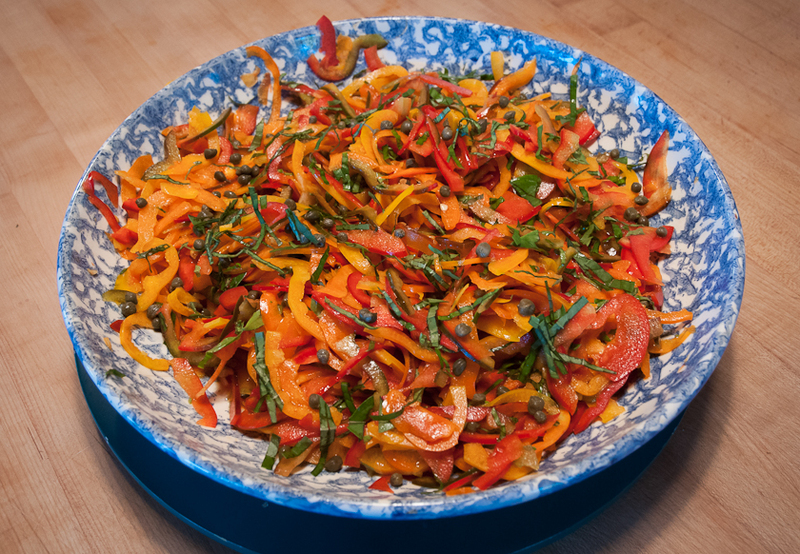 This beautiful and delicious pepper salad was a perfect substitute for coleslaw. Next time I make this salad, I’ll try adding red onion, perhaps pickling it first before mixing it with the peppers and I’ll add some kalamata olives if I don’t have nicoise. 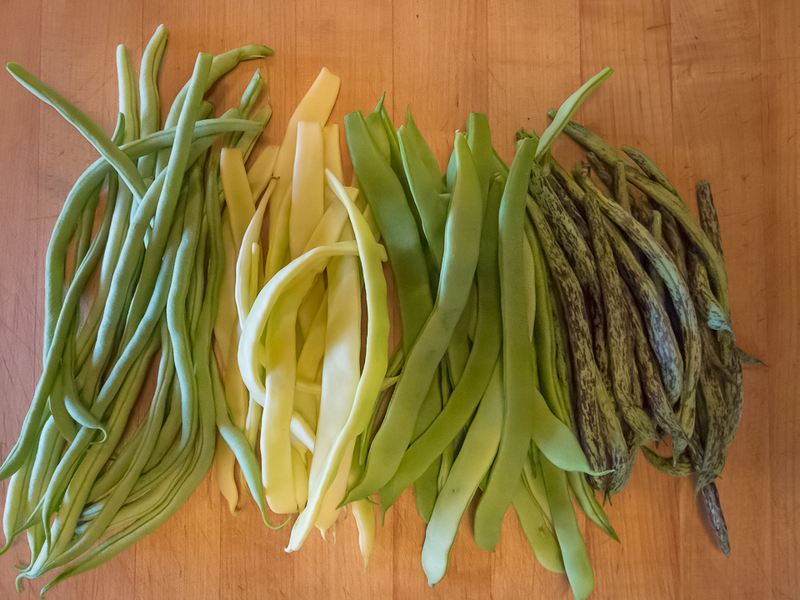 I might also toss it with some green beans, boiled three to five minutes until tender and cooled. The colors and flavors would pair perfectly. As the pepper harvest continues, I’m going to look more carefully at Waters’ other pepper recipes. The Stuffed Roasted Red Peppers with breadcrumbs, herbs and sheep’s milk cheese tempts me. It’s a formal portrait recipe but I’m anticipating that there will still be plenty of room for the cook’s imagination.